For many, the answer is that they’re more focused on compliance. Don’t get me wrong, compliance is still important, but many companies are missing the mark when it comes to the regulations. What are the real differences between quality and compliance focus? Let’s take a look. Free Resource: How to determine if your company is quality or compliance focused. Download now. A lot of companies don’t embrace regulations, they almost resist them and look at them as an impediment. For example, engineers will look at design controls as something that’s stifling innovation and slowing them down. Production can be the same; “this is just busy work. Why do I have to document this? Why can’t I just fix it?” A lot of companies are just trying to get by, looking for the path of least resistance to satisfy compliance. They haven’t really embraced and incorporated ISO 13485 or 21 CFR 820 as part of good business practice. These regulatory guides define everything from design and development, to purchasing and quality event management. They’re fairly exhaustive, but in general, they’re very much in sync with one another. If your quality system meets the FDA standard, there’s a good chance it will also meet 13485, although this is not a given. Companies often look at these regulations and try to “check a box.” They’re just trying to get through an audit or appease an inspector. They don’t adopt the standards as best business practices because they are compliance-focused. From a business perspective, they can be missing out on many opportunities. On the other side of the fence, if you adopt these practices as part of good business practice, you’re well on your way to being a quality professional and/or leading a quality organization. Compliance-focused individuals look at quality as being the quality department’s responsibility. They look at the SOPs as an impediment to doing the job rather than the value they can add to an organization. They want to check the appropriate boxes and forms to “CYA” from an audit perspective. I would describe this as a very reactive approach, often accompanied with a victim mentality. These companies tend to build silos or walls within their different functional groups, with each group resisting quality measures. I’ve been inside companies where the quality department is almost viewed as an “internal affairs” team, with an investigatory mandate. Their peers view them as people whose main focus is to implement new rules and processes they have to follow. Is this a power or domain thing among departments? I don't know, but it’s strange to see quality take this sort of role in organizations. Sometimes they get so singularly focused about adherence to regulations that they forget they’re developing products to improve or save lives. This is another behavior of a compliance-focused organization. How can I really be trained already? How many people are “trained” after some self-study on a software program? Furthermore, when I went through the list, there were procedures that conflicted with one another and some that were duplicates. Different departments were doing their own thing and it would have been a nightmare to manage. From a quality perspective, there’s a bit of art and science behind it. Of course, compliance is still important and medical device companies need to demonstrate that they’re meeting the intent of these regulations. However, this notion that it’s the domain of the quality department is outdated and doesn’t serve any company well. The best medical device companies in the business have embraced the mindset that quality is a cross-functional responsibility. Everyone has a hand on the beating heart and it doesn’t matter which department they belong to. Part of it comes down to the design or approach of your quality system. We’ve previously talked about “right sizing” your quality system. If your company is an early-stage startup, you first want to make sure you’re focused on the parts and pieces that are currently applicable to you. If you have no products on the market yet, I’m a fan of “bootstrapping” your QMS. There are a handful of areas that apply to you at the early stages, such as design controls and risk management. Both of these help you to deliver a better, safer product to end users. If you’re using external suppliers, then supplier management is another area you need to cover early on with your QMS. It’s about having the right controls in place to achieve your quality criteria. Document management will also be necessary, including having a solid process in place for review and maintenance. A mindset of continuous improvement helps with the establishment of a “right-sized” QMS. You will need a set of KPIs, but don’t go overboard. There are probably one or two at most, per process, that you should have. For the overall health of your QMS, you probably only need a few. First of all, you have to be more productive. If you understand your role and how it fits in the big picture of the company and how your products are being used, you’re going to be more productive. Also, you’ll probably enjoy coming into work and making a difference! When you’re in this mode, you’ll be able to see your impact with how you’re helping people. This approach also allows you to be a bit more creative or innovative. People often think this is the antithesis of compliance, but that’s not true. There’s always an opportunity to find a better way. A simpler way. To be more collaborative. From a business perspective, when quality is embraced across the organization they will have fewer negative events to address. A culture where there are a lot of complaints coming in about a product tends to deteriorate rapidly. You’re always fighting to put out fires and it’s a strain on your business, especially when you have to consistently devote dedicated resources to investigate those complaints. Downstream noise can include rework, product changes or process changes. When this happens too often, you have a systemic issue and CAPA situation, with more resources required to resolve the problem. It’s not to say that you’ll never have CAPAs as a quality-focused company, but you’ll most likely have less because you’ll be working with a mindset of continuous improvement. There’s been a dance between organizations and regulatory authorities for a long time. Talk to any company today and mention an FDA inspection -- they’ll more than likely get tense. Inspections can be contentious because companies feel like they’re on trial. To use an analogy, imagine you’re driving down the highway, keeping up with the speed limit and using all necessary signals. You glance at your rear view mirror and spot a police officer driving behind you and your heart rate immediately goes up. This is a natural reaction for most people, right? Even though you’re doing nothing wrong. Companies often seem to view their regulatory agencies this way, as a police officer rather than a partner. The FDA is doing something about this. The whole notion for their Case for Quality initiative is that they want to work effectively with companies. Rather than companies shifting into panic mode in order to “get ready” for an FDA inspection, the FDA should be able to turn up at any time and find a “business as usual” situation that meets standards for both quality and compliance. If you change your behavior because you have an impending FDA inspection, this should be a clue to you that maybe you’re not where you should be from a quality-focus perspective. The majority of medical device companies today are still paper-based. There’s an underlying fear of software validation (Part 11), yet none of the systems and processes “talk” effectively to one another. A few of our current customers previously worked in larger companies where overly burdensome processes were put in place to comply with Part 11. Those companies are 20+ years behind in their operation processes, which creates a lot of unnecessary steps. We spend a lot of time with our customers explaining the newer (and simpler) approach to software validation and other processes. This topic, in general, is why so many companies remain paper-based. They look at software validation as an extreme burden and don’t want a modern, unfamiliar tool. Many of those old tools don’t even “speak” medical device, so you know they don’t meet the FDA’s more recent guidelines. Organizations get stuck in “quality purgatory” with overflowing folders of paper files and filing cabinets, copies on hard drives, and documents spread all over the company. This ad hoc system is impossible for making informed decisions. So, what do they do? They probably have to become a spreadsheet jockey, manually entering data from the paper that they can find. However, this data is suspect, because how do you know it’s accurate or even up to date? This approach puts your company on a slippery slope and prone to making costly mistakes. 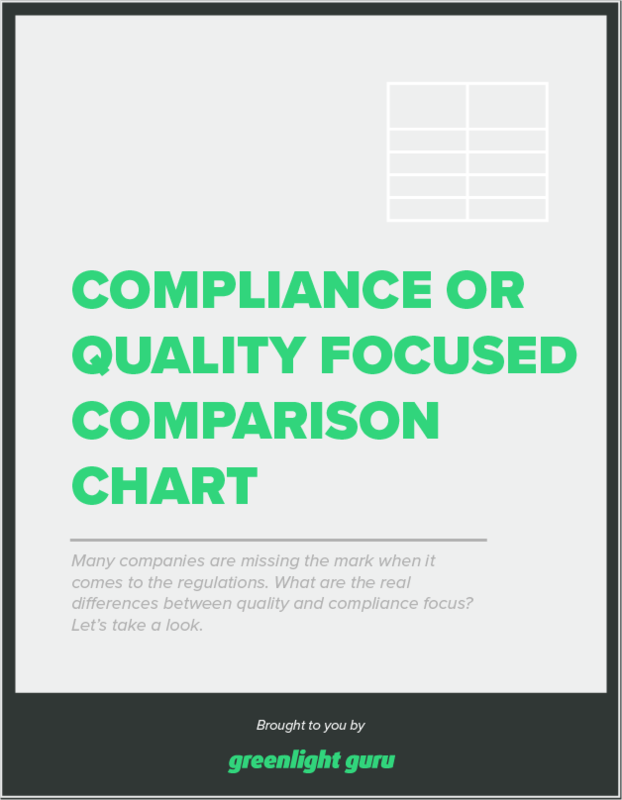 Free Comparison Chart: See the difference between quality vs. compliance focused companies. Click here to download the PDF resource. Greenlight Guru was developed to serve as a medical device company’s single source of truth. Everything on the software platform is visible and data is collected to allow key processes to be easily analyzed across teams. Instead of someone tracking paper trails, Greenlight Guru automatically tracks all activity. In the medical device industry, we’re in the business of saving and improving lives. It’s a humbling responsibility and has every reason to be as rewarding to the organization as it does to the patients served. It’s important to make good decisions about that, instead of being stuck in the old ways of doing things. Without having to worry about checking all the menial boxes on your coffee-stained compliance checklist, you can adopt a quality-focused mindset so you can focus on both the patient and your optimal job performance. 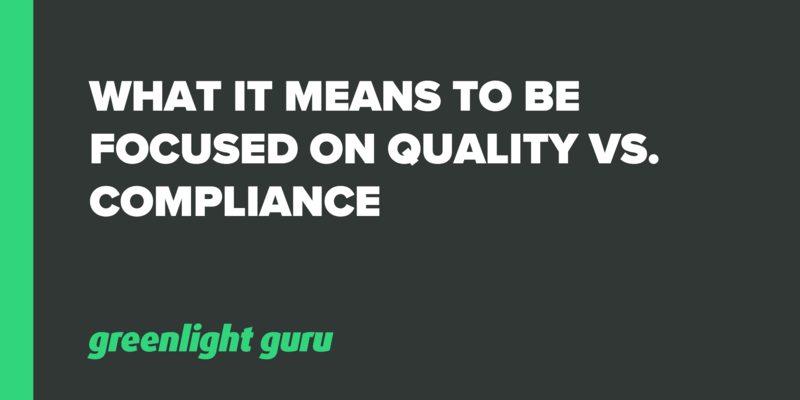 Greenlight Guru’s quality management system gives medical device companies peace of mind because it’s designed to be workflow-based, and integrate all the things you need to be compliant AND remain quality-focused. Is your Company Compliance or Quality Focused?